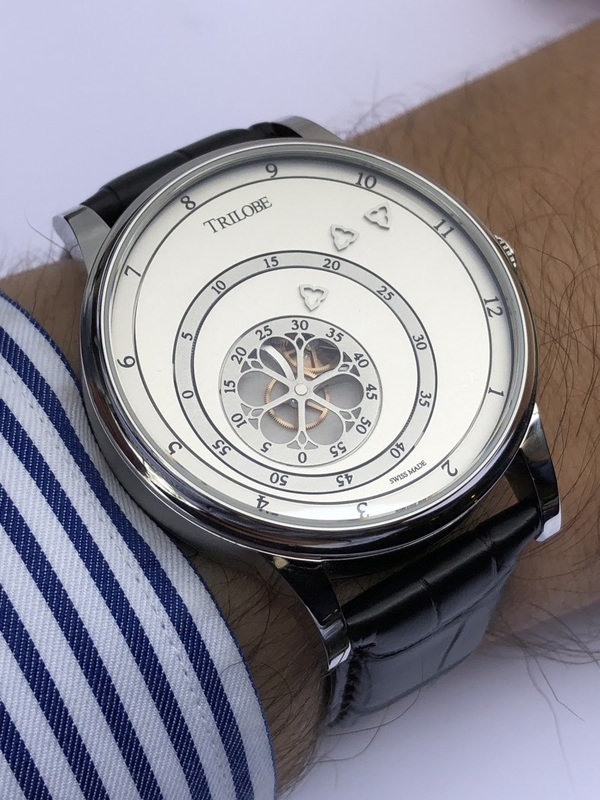 Hands on review of the Trilobe "Les Matinaux"
The French watchmaking sector has been experiencing a real revival for several years. Well, to be more precise, I should rather talk about the dynamics driven by French creators and entrepreneurs because in most cases, their watches can't be considered as "French watches". Now, what matters most to me is not the country of attachment but the interest and the power of seduction of the projects. A watchmaking approach only makes sense if it brings something new. It is precisely in this logic that Trilobe, the brand created by Gautier Massonneau, finds its path. The ambition of the young French entrepreneur is not only to redesign the time display but also to redefine the relationship that can exist between a brand and its customers. In fact, Trilobe is a project that encompasses both a product and a strategy of relationships with collectors. 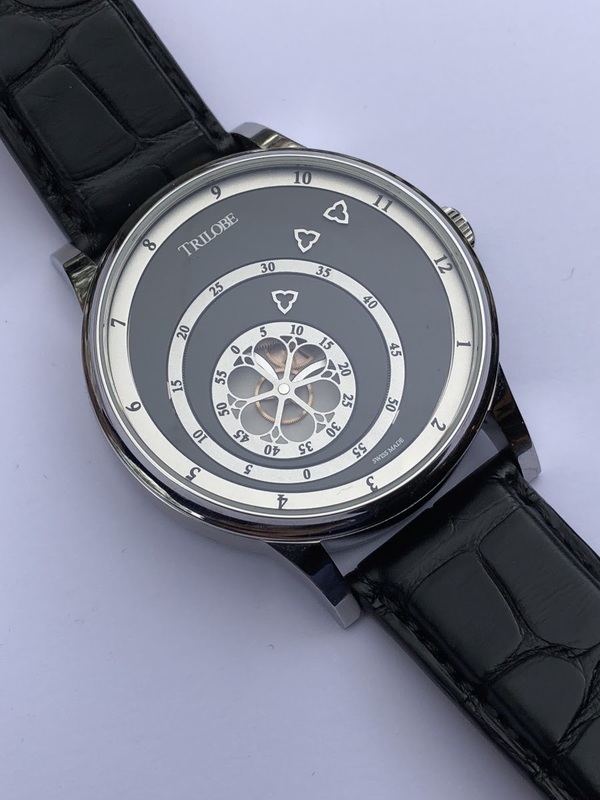 Trilobe takes its first steps through its inaugural series "Les Matinaux" which will be released in September in a context of 100 pieces and available in three different dial colors: silver, gray and blue. The main idea is to offer a new time display by removing the hands, replaced by fixed indexes and rotating disks (or rings). I write it very frankly: a display based on such system is neither new nor innovative. It is found nowadays for example on a Seiko Discus. Of course, all the watches with fixed indexes of the 70s also come back to our minds. They were mass produced at the time of the last jolts of mechanical watchmaking which was struggling for its survival against the quartz offer. However, the dial of a Trilobe watch differs from these examples. Firstly the discs are not concentric which is far from being a mere story. Then, the fixed indexes are not aligned. 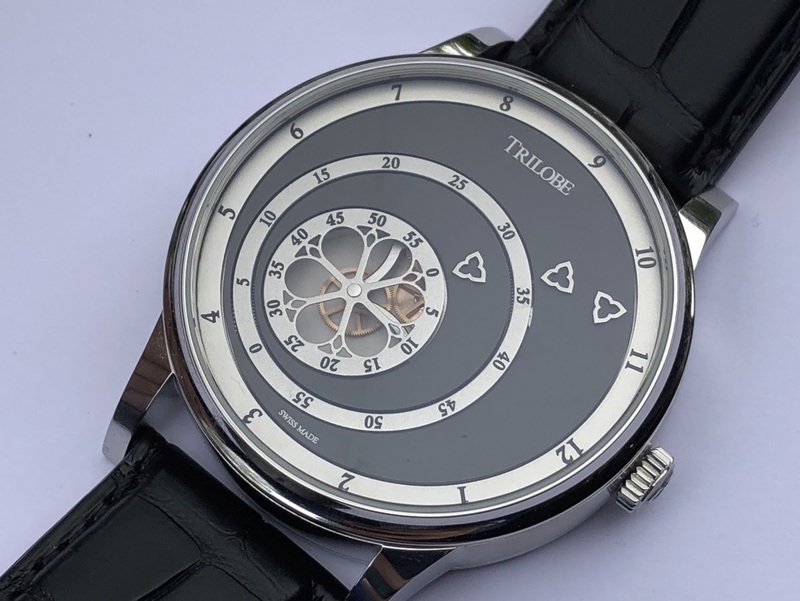 In fact, in a traditional way a watch with fixed indexes presents itself with an unique horizontal (as on a Discus) or vertical (as on a Klokers) reference. 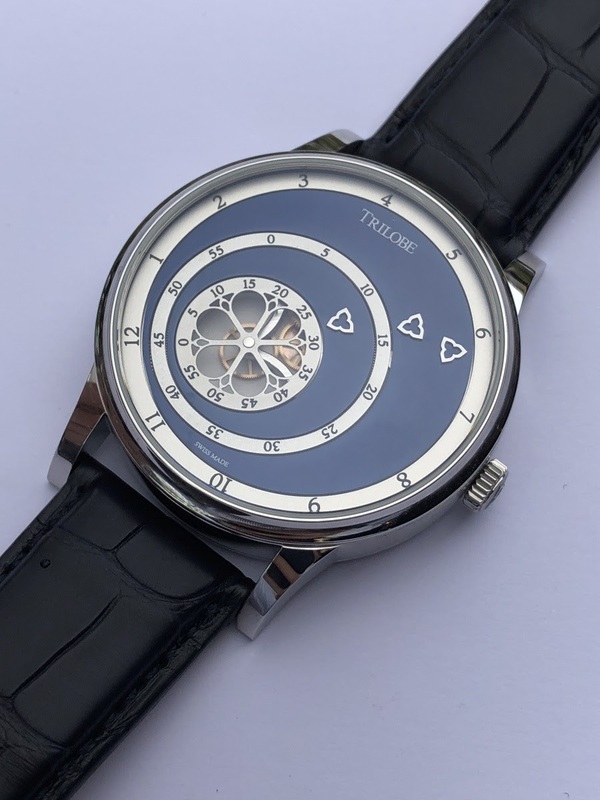 By locating the marks between the disks and because of the shifted locations of the disks, the Trilobe watch dial of creates a stylistic dynamic by sketching a non-rectilinear movement from the Southwest to the Northeast. I really like this visual effect which is the strong asset of this piece. The uniform and rigid rendering of this type of watches was shaken up and the asymmetry brings character and a certain aesthetic interest. In addition, the location of fixed indexes seems to have been done randomly. The three indexes are not aligned while obviously nothing prevented from doing it from the pure technical point of view. These small gaps between the indexes give fantasy and character without compromising the legibility: after all, the indexes remain close enough in order that our eyes focus the same dial zone to read the time. The dial lay-out is presented as an alternation of moving elements and fixed zones while respecting the usual order imposed by a classic mechanical movement: the seconds on the small disk then the minutes on the intermediate disk and finally the peripheral hours. The medieval aesthetic influence that Gautier Massonneau wished to distil is found in the large rosette of the seconds disc and in the fixed indexes. The large rosette has three virtues: it decorates the dial like a cathedral, it animates the dial and it creates an opening on the mechanism of the display module, adding a touch of technical dimension to the watch. The indexes reproduce the logo of the brand that explains its name: Trilobe. It is in fact the outline of a three-lobed rosette whose shape is consistent with the presence of the moving rosette. This medieval inspiration is original and refined. It brings singularity to a watch that could have appeared too rigorous or even austere. However, given their small size, the trilobed indexes look like hearts and adding to the obviously floral aesthetic of the rose, the whole seemed to me a little too feminine for my taste. In any case, the finish of the dial is irreproachable: the numbers are inscribed with finesse and precision and I liked the slight contrast between fixed areas and moving parts. The case of the series "Les Matinaux" is available in steel with a diameter of 41,5mm. This diameter has been chosen with care: it is large enough to allow a good time legibility while remaining in approximately reasonable dimensions. The counterpart of this diameter which exceeds 40mm is that it increases the size of the disks (which is logical to improve the readability). The watch requires a powerful display module that optimizes energy consumption. The mechanism of the watch is thus composed of a base caliber ETA2892-A2 which powers the exclusive module developed by Chronode, Jean-François Mojon's company. The aim of the module is to manage and animate the three non-concentric disks dedicated to the display. 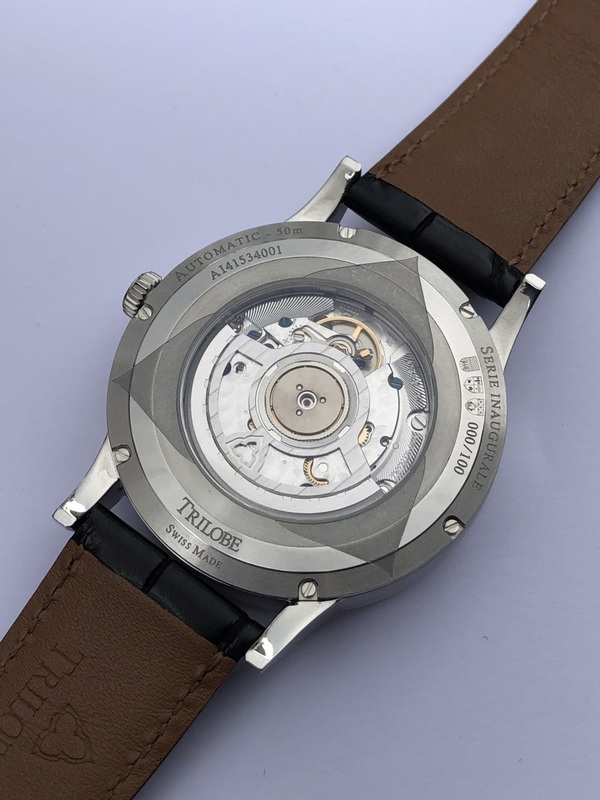 Its efficiency seems excellent since the announced power reserve of the mechanism (42 hours) is similar to that of the basic caliber without the module. The basic caliber is visible through the transparent back of the case. Its decoration remains basic even if the three-lobed logo is found on the oscillating mass and the three-lobed shape surrounds the glass surface. I sincerely believe that a beautifully decorated caseback would have been more relevant but commercial reasons have pushed to make visible the basic caliber. 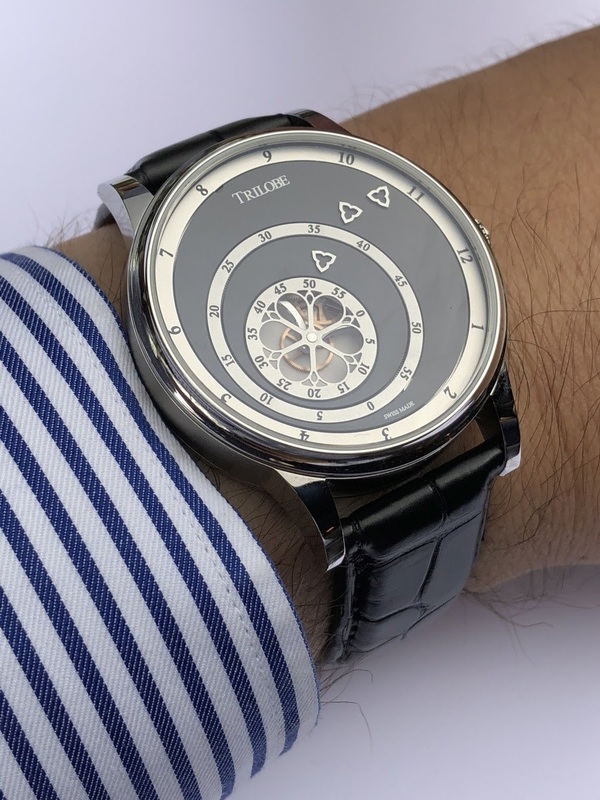 Once put on the wrist, Trilobe's first watch leaves a favorable feeling. It gives off a kind of tranquility due to the absence of hands. Time seems to flow more slowly which is after all a very pleasant feeling. The movement of the rosette, the fastest element on the dial, remains very discreet given its shape. Whatever the version, the series "Les Matinaux" offers classic colors without any surprise but the simple and delicate atmosphere imposed this good taste approach. My favorite version is the grey one that I find very elegant. The silver dial is too conventional and the blue one seems a little too much to respond to a current trend of the watch industry. The initial series from Trilobe will be available from the back to school period. As mentioned previously, one of Gautier Massonneau's ambitions will be to look after the quality of the relationship with customers. The watches will be sold in Paris in a dedicated salon near the rue de la Paix. In addition, the watches will be delivered to their owners during a collective ceremony in the presence of Jean-François Mojon to meet and discuss with the creator of the display module. After all, why not even if I have some doubts about the relevance of this approach. Many collectors prefer discretion and don't necessarily want to attend a big event to get their watches on their wrists. Now, the most difficult step starts for Trilobe. Time is coming to sell the series and explain its added value. To be honest, I consider that the aesthetic approach and the emotion aroused by this classic watch not devoid of originality are its main strengths, more than the technical context. 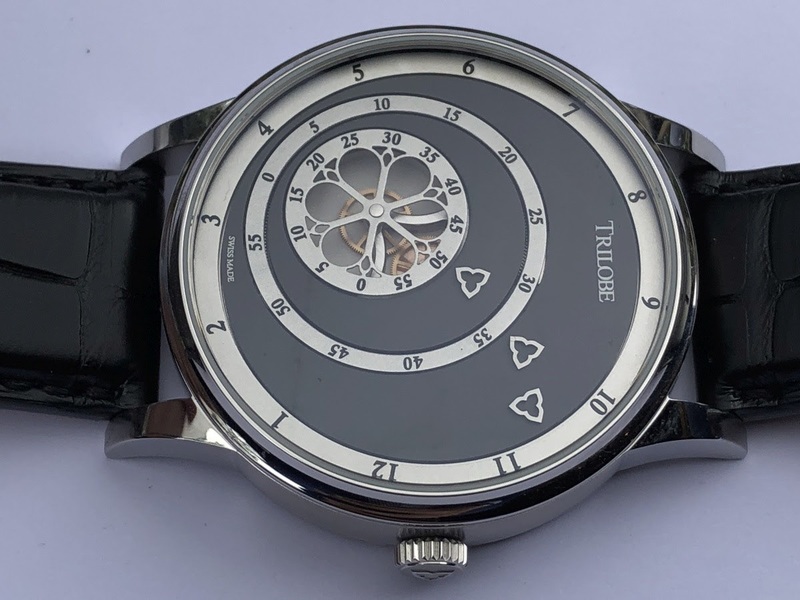 In addition,Trilobe will have to convince potential buyers with a price around 7,500 euros for a piece animated by a caliber ETA2892-A2 and a module (yet exclusive). The task is not simple but the watch features several convincing assets. Thanks for sharing , very interesting watch . Price is a bit high but maybe when you see it in person its worth every penny ! The review I've been waiting for Having reserved a piece, the price, excluding French VAT, is € 6,100 if one opts to collect this piece outside of France. Cheers. Innnnnteresting The movement kind of counter-acts everything I am attracted to on the dial side...Solid back a better choice? but.... still.... unique expression of time and design. Bravo.